The Julia Tyler First Spouse Gold Coin will be released during 2009 as the eleventh release of the First Spouse Gold Coin Program. During 2009 a total of five different coins will be issued for the series. Julia Tyler was the second wife of President John Tyler. She served as the first lady after their marriage on June 26, 1844. She was the First Lady for eight months. Coins will be issued in both proof and uncirculated finishes. Each coin contains one-half ounce of 24 karat gold and is considered a legal tender numismatic item. 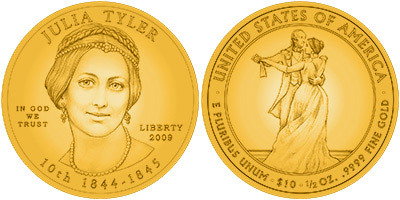 The release date for the Julia Tyler First Spouse Gold Coin is scheduled for summer 2009.